English lecturer Elisa Lorello has proved that publishers and literary agents are no longer essential to climbing the bestseller lists. 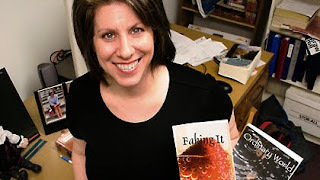 Self-publishing her first book “Faking It” through Raleigh-based LuLu.com, book sales reached a meager 100 copies its first year. Then Lorello decided to publish her novel as an e-book for Amazon’s Kindle. “Faking It” received moderate attention as a $1.99 e-book, but after cutting the price to 99 cents Lorello, watched as sales quickly began to rise. By the end of 2009, her first novel swiftly moved through the rankings, and in January 2010, “Faking It” hit No. 6 on Kindle’s bestseller list. Currently placed at No. 1 in single women’s fiction, it has sold over 15,000 copies to Kindle users. The accomplishments of Lorello and her novel mark major changes within the publishing industry. Digital books have gained an increasing amount of popularity and are becoming the preferred method of reading. As demonstrated by the success of “Faking It,” self-publishing allows gifted writers an opportunity to share their work. The successful self-published author released her second novel and sequel to “Faking It” titled “Ordinary World” in November of last year. Lorello was featured on NCSU.edu in the article One Hot Read, and last month Lorello’s success was published in The Charlotte Observer.